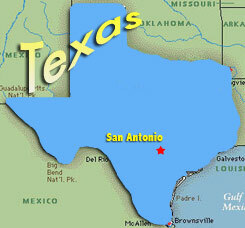 The Marine Aquarists Association of South Texas (MAAST) was established in the summer of 2002. There was not much of a market for Reef keeping in San Antonio, at that time, so the original creation of MAAST, was a chat room on Yahoo, called SanAntonioReefers@yahoo.com. 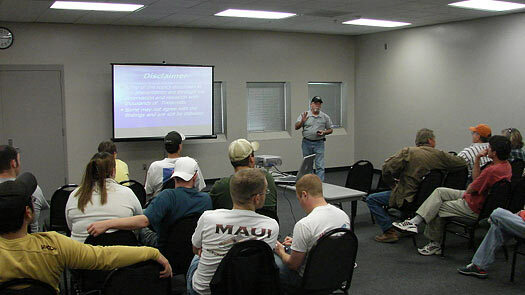 Our first meeting was held in early 2003, only 8-10 people attended. Now MAAST Members have grown to the quantity of 250 Charter Members and an a numerous amount of active Web Members. We hold Meetings monthly, based on Education or Social Events, annual Frag Swaps and hosted our first annual Conference TMAC. 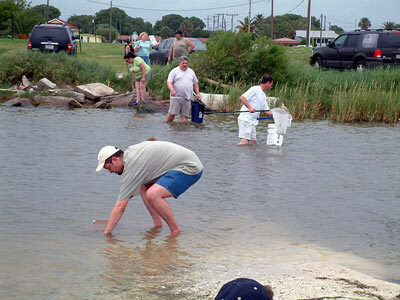 We also with the support of MARSH, and DWFMAS, host an annual BigBird Port Aransas Collection Trip and BBQ. MAAST offers a Salt-Water Library, the Equipment Bank, and the Pay It Forward Program, which promotes Coral Propagation and engagement from our Members. Our Website produces an enriched library of its own, where Members are able to post or read threads in forums, based on their own reef needs. Our Members receive the Monthly MAASTARD, our Newsletter, and are able to submit photos for a Monthly Contest. MAAST, appreciates the support of its Members and the 33 Local and National Sponsors that help in the success of both the Member and MAAST. Our organization includes Charter, Web and a Junior Membership, which are led by the Board of Directors who are elected through a popular vote by the Membership. Charter Memberships are $25 annually per person; Junior Memberships are $15 annually per person. There is no Membership Fee for a Web Member. Currently we have over 250 Charter Memberships, and a very active Web Membership. 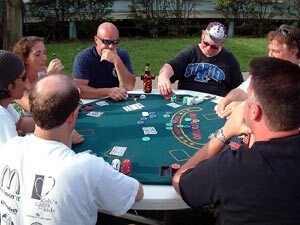 We host monthly meetings, which is based on Education and or Social-Events. With the continuous growth of MAAST, we will be adding a additional Events Coordinator, one who will concentrate on Education and the other will concentrate on Social/Family aspects of MAAST. With the scheduling cooperation of Bass Pro Shop and Cabellas, we are able to host our meetings in one of their Conference Rooms. Our goals are to bring in one Speaker per quarter, and we are fortunate to have Members who share their knowledge to continue the development of our hobbyists. Barry from Clams Direct discusses their needs and care. All active Members are able to engage in the Programs that MAAST has to offer. One of the foremost agenda on MAAST, is to be able to give back to its Member(s) and their families. We at MAAST proudly focus on the family in our Organization. MAAST strives to reach out on education through speaking presentations and conferences. Tank Tours and Frag Swaps are a more social-style atmosphere, where cook-outs and fun take place. 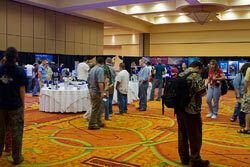 TMAC (Texas Marine Aquarists Conference) was the largest event that MAAST has hosted. 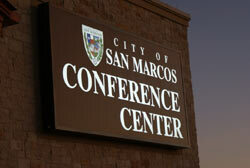 MAAST plans to host this conference annually. We were fortunate to have speakers such as Anthony Calfo and Eric Borneman, both who gave presentations on Reef Sustainability, Marc Levenson on Reef Photography, and Peter Kordelski gave his expertise on Refugiums and Sumps, remaining true to our efforts to continue to educate hobbyists both from MAAST and other neighboring clubs. 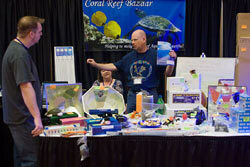 For the down times, in between speakers, TMAC also provided an array of outstanding vendors, such as Cherry Corals, ZoaNuts, Seachem, and Precision Marine along with many others. 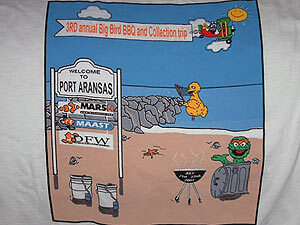 The BigBird Port Aransas Collection Trip and BBQ started in 2004, between two Clubs Marsh and MAAST. 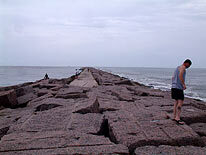 In 2006, DFWMAS joined the annual pilgrimage. The Collection Trip and BBQ is held on a weekend, every year in July. 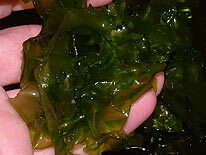 On Friday night, a huge bonfire lights up the coast, and Members from all groups get together and talk "fish tales." 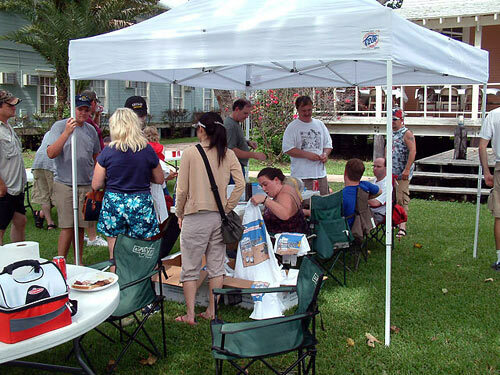 Saturday afternoon, Members congregate for a Texas style BBQ, and a large raffle. After the BBQ, everyone heads to the Jetties, to collect Peppermint Shrimp, Blennies, Damsels, Seahorses, and it has been known a few Raccoon Fish. This year will be the 5th Anniversary of the Collection Trip and we are fortunate to have Bob Fenner collecting with us. 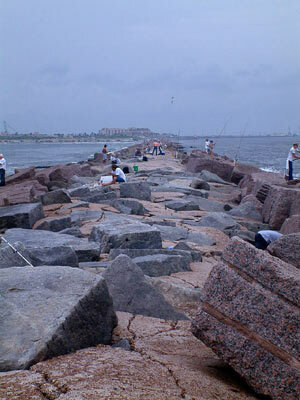 The man-made jetty is one mile long. 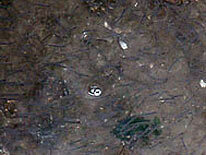 While dangerous to traverse, this is where you find many critters. 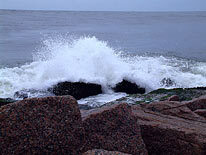 The shore was teaming with life. 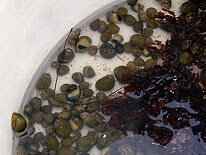 In another area, we found Nerite snails, pipefish and more. 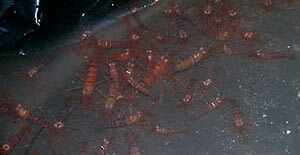 Some of the Peppermint shrimp caught. The Annual Frag Swap is normally held in March, but due to TMAC this year, it was decided that we would host the Frag Swap in June. Our Frag Swaps are informal. We invite MAAST families to come and eat fajitas (another Tex-Mex tradition,) with all the trimmings, and later there is business to attend to, such as coral swapping and trading. Everyone leaves full and happy. 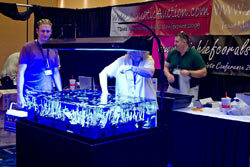 The Pay It Forward Program is responsible for coral propagation and trading. 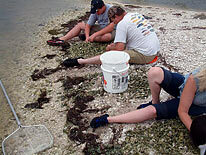 We have taken on the responsibility that saving the reefs starts here. This program has been place less than a year, but has been received with great enthusiasm by both the experienced hobbyist and the new hobbyist. With the Pay It Forward program, the Sponsor, the person who initiatially grows the coral, places the coral for donation. The person who receives the donated coral, will also allow the coral to grow, and once it doubles in size, will donate a frag on to another interested member. The Pay It Forward program requires its own forum and the Sponsor is required to document the lineage of the coral that has been donated. Both the Library and the Equipment Bank were started in 2008. The Equipment Bank and Library assists all actives members. The Equipment Bank consists of the MAAST cart, which is used for "Tank Moves" that could not be made possible without it. (As for part of history, each member who utilizes the MAAST cart, brands the cart with his name and date of use.) A more recent addition to our Library, Anthony Calfo donated his own, "C-The Journal Publication set." I am sure that this donation will be enjoyed by many. The Picture of the Month Contest has grown to be quite a success. It is a friendly, monthly competition, where active Members submit an entry based on the current month's subject. 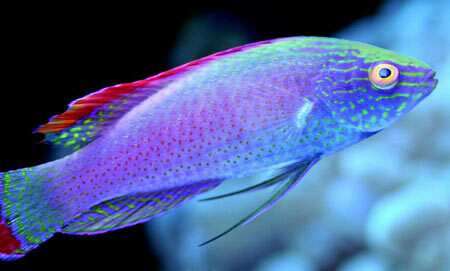 (Such as a Surgeon Fish, Invertebrate, Zoanthid, etc.) The winner is decided by active Members who vote within the thread, and is posted on the front of the Monthly MAASTARD, our Newsletter. The Marine Aquarists Association of South Texas is a great group of people who are always willing to contribute, and share their experiences. MAAST members are dedicated to the future of its club. In the future, the MAAST BOD plans to expand on both our Library and the Equipment Bank, by adding to the yearly budget for the enrichment and education of our members. MAAST also plans to step out the box during the holiday season; this year we plan to include a Food Drive in late October and early November. 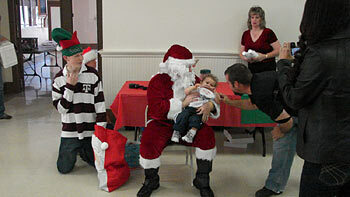 We will also organize a Toy Drive at our LFS, and have our second annual Christmas Party. MAAST's outlook is to be able to give back to people inside the hobby and out. 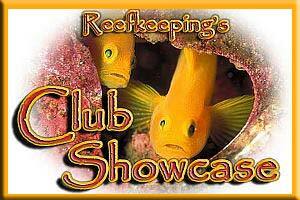 If you would like to showcase your club in Reefkeeping Magazine, please email the webmaster for more information.